Everyone loves those crispy noodles you get as toppings in some high-end Asian restaurants. Making these crispy noodles, watching them burst into the air in the pan is a bit like magic. The Thais make whole dishes out of crispy noodles, so feel free to experiment. Scrumptious on their own, and great as a topping for lettuce wraps (as pictured here), stir-fries, salads, soups, and more! These crispy noodles are made with regular supermarket rice noodles (the skinny kind), which makes them gluten-free. The key to crispy noodles is having the oil hot enough - you'll get all the details below. Separate rice noodles by pulling apart the various sections into manageable amounts. Using scissors, cut the noodles into 4- to 5-inch lengths. Place oil in a wok or small to medium size frying pan (the smaller the pan, the less oil you will have to use). Heat oil over medium-high heat for a minimum of 1 minute. Take a few longer noodle pieces in your hand and dunk in just the ends. When the oil is hot enough, the submerged parts will 'bloom' within seconds into puffy, crispy noodles. If this doesn't happen, remove the submerged parts and cut them off. Wait a little longer for your oil to heat up, then try again. Now gently drop handfuls of noodles in the hot oil. Have a utensil at the ready to quickly flip them once, then remove. The actual cooking time is only a few seconds. Set puffed noodles to drain on paper towels and shake over a little salt if desired. Continue frying the rest of your noodles, reducing heat as you do so to medium. 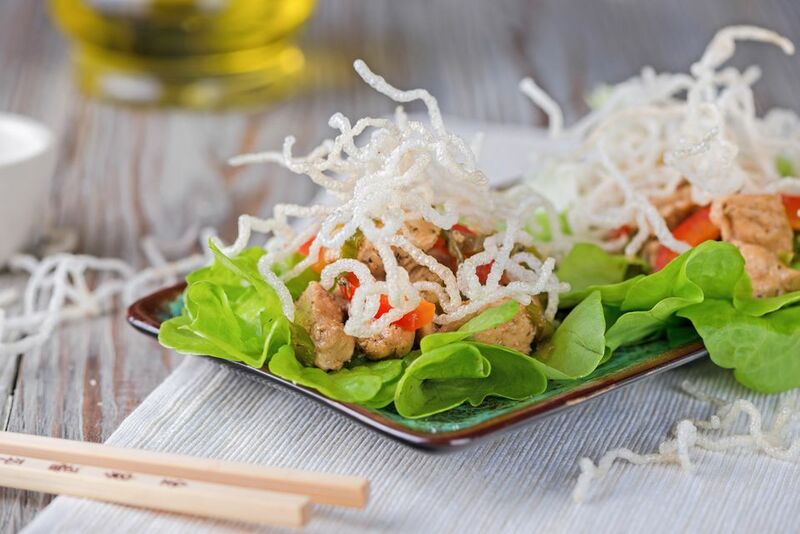 Use your crispy noodles as a topping for lettuce wraps, soups, salads, and other Asian dishes. Crispy noodles also make a great snack. Crispy noodles should be eaten up the same day, or store them in Tupperware containers overnight or longer (no need to refrigerate). How long they will stay crispy depends largely on the climate and level of humidity where you live.